Little India is popular with visitors to Singapore who can’t get enough of how ‘un-Singaporean’ this Indian heritage district is – neat rows of tall buildings and Singapore’s legendary clean order give way to a more colouful, bustling area of older shophouses and the perpetual scent of spices and flowers in the air. 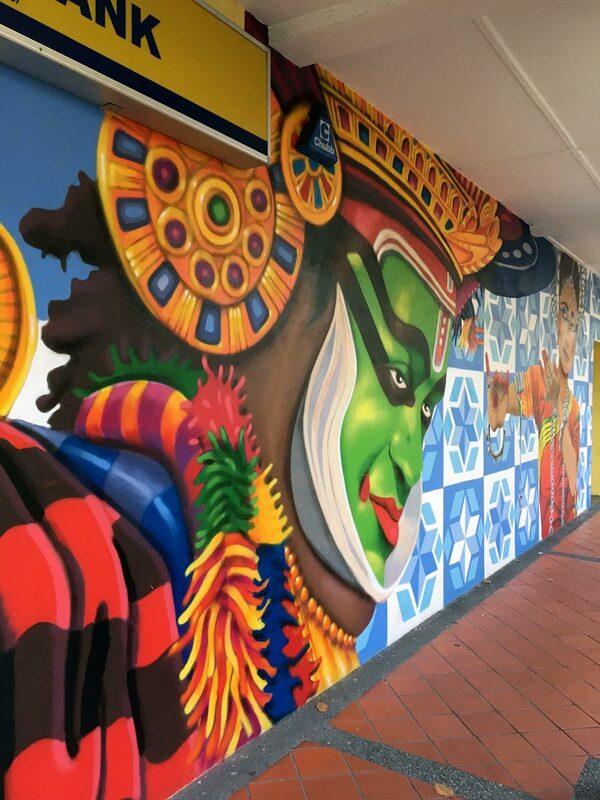 In recent years, colourful Little India has also become a prime area for spotting street art and murals in Singapore – Here’s a detailed guide on where to find all the street art in Little India while visiting some of its more popular landmarks. 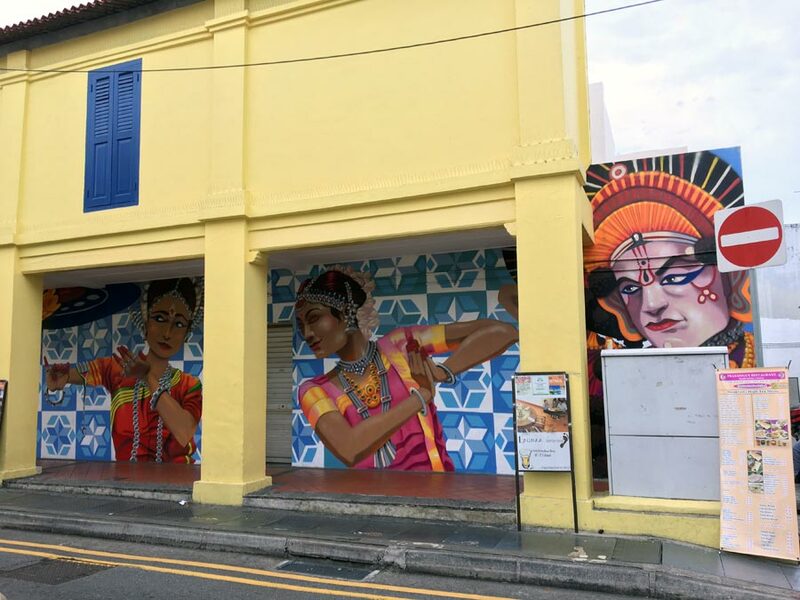 The surge in number of works is largely thanks to the emergence of ArtWalk Little India, an annual arts festival that embeds artworks that reflect the heritage and culture of this colourful neighbourhood. Little India is a fairly large neighbourhood that you can spend a fair amount of time walking around in. I’ve split the map into 4 major areas near some major landmarks so it’s easier for you to navigate. Use the quick links above to navigate and read about more details about the artworks and artists, as well as where exactly to find some of the more elusive works. Check out Singapore Street Art on Instagram for more places in Singapore to discover awesome street art, or my embedded Google Map below. 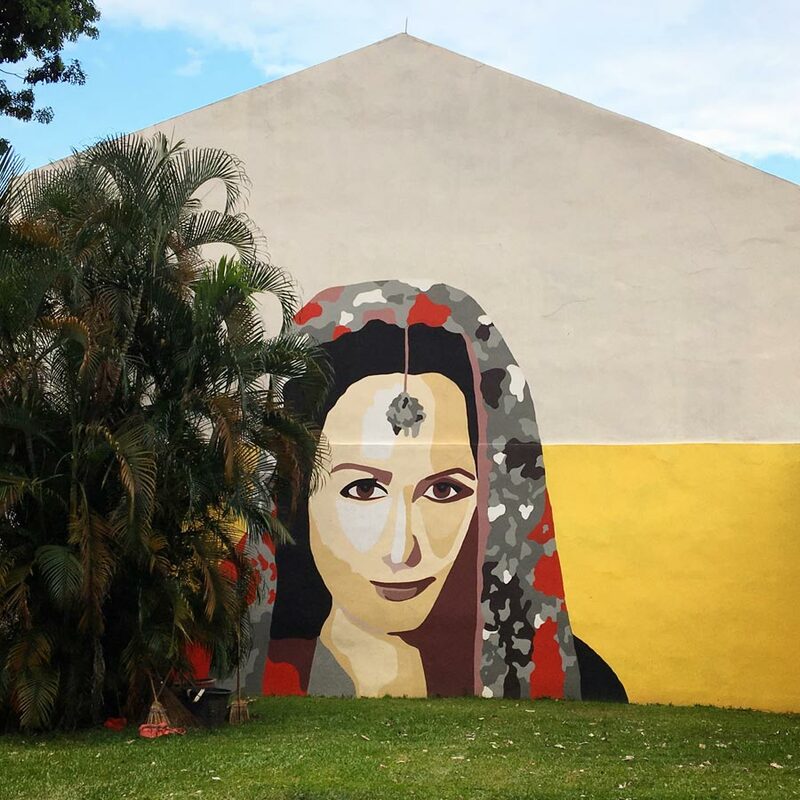 If you are in Singapore, you can also check out my guides for Kampong Glam or the Bras Basah-Bugis district for more street art, or see my full line up of street art guides from Asia and around the world. Cattleland 2 is pretty bright and cheery! Cattleland 2 is by artist Eunice Lim created for ArtWalk Little India 2017. 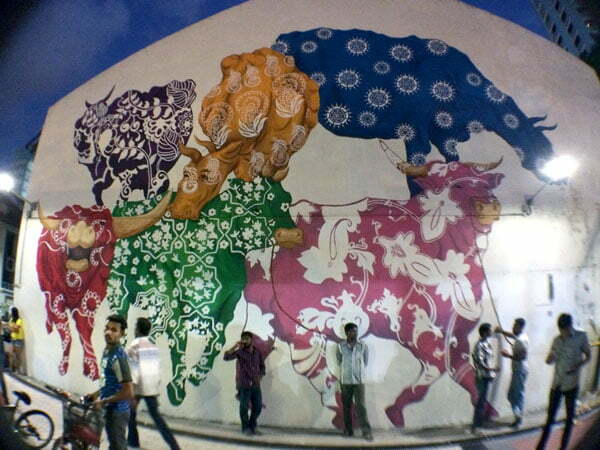 The work is a tribute both to the name of the nearby Kerbau (that’s a Malay word for Buffalo) Road and the reverence that Hindus place upon cattle, look closely at the traditional Indian patterns on the cattle. The original Cattleland by night taken in 2015 – it’s a huge piece that apparently the artist drew freehand with just a grid to guide her! 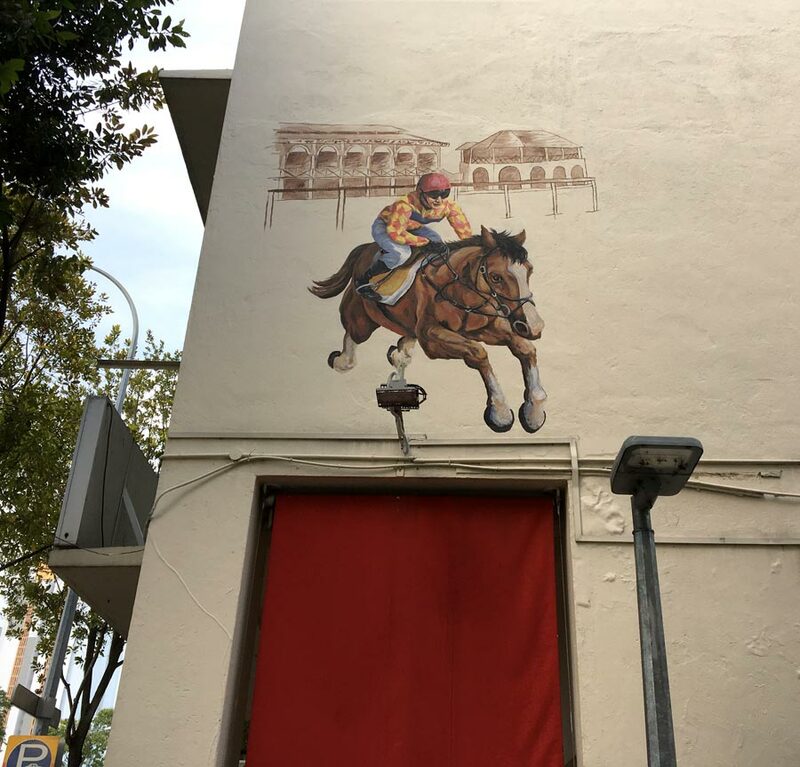 This 20m long mural is called A Ride Through Race Course Road, showing a race horse galloping through a crowded traditional Indian street market. It’s a visual story that tells you how this road got its name – from the nearby Farrer Park area that used to be a horse racing track. This community mural was painted by Jaxton Su with the help of migrant workers and students. This large climbing Jasmine is another Artwalk Little India 2017 work called Madam Mogra, Jasmine of the City, a tribute to the sacrifices of migrant workers who come to Singapore to work for higher wages. My favourite part of the work is around the back where you’ll see a rather lifelike squatting worker in construction clothing tending to the Jasmine plant. You’ll notice that this is quite a busy alley despite being quite well hidden as lots of people and workers take their smoke breaks here. A well known Singaporean visual artist, Speak Cryptic‘s trademark pieces are in black and white and match pretty well with the aesthetic of the Park 22 Hotel which has the Colonial black and white houses theme. The flowers in this mural called In The Clouds are a mix of chrysanthemums, jasmines, orchids and marigolds, flowers that you will find in the traditional garlands sold along Buffalo Road. You’ll often find these flowers interwoven into Indian women’s saris as well. 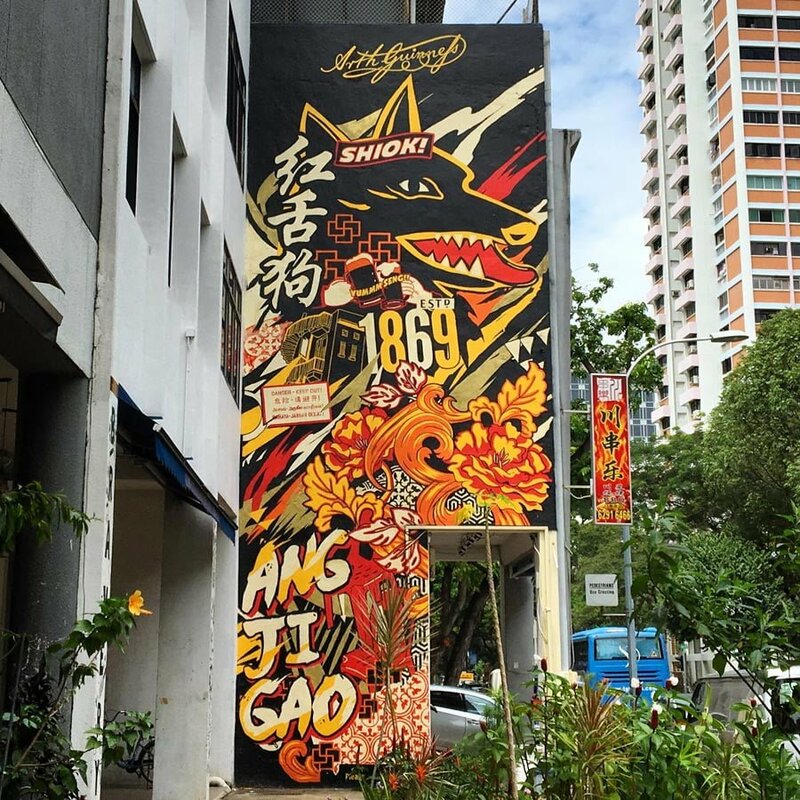 This artwork by Singaporean street artist Zero was also done for Artwalk Little India 2019 is called DIFF/FUSION and is inspired by the distinct smells of cumin, coriander and other popular spices used in Indian culture that you scent in the air as you walk around the area. It’s a visual representation of the sensory overload one often feels while exploring Little India. 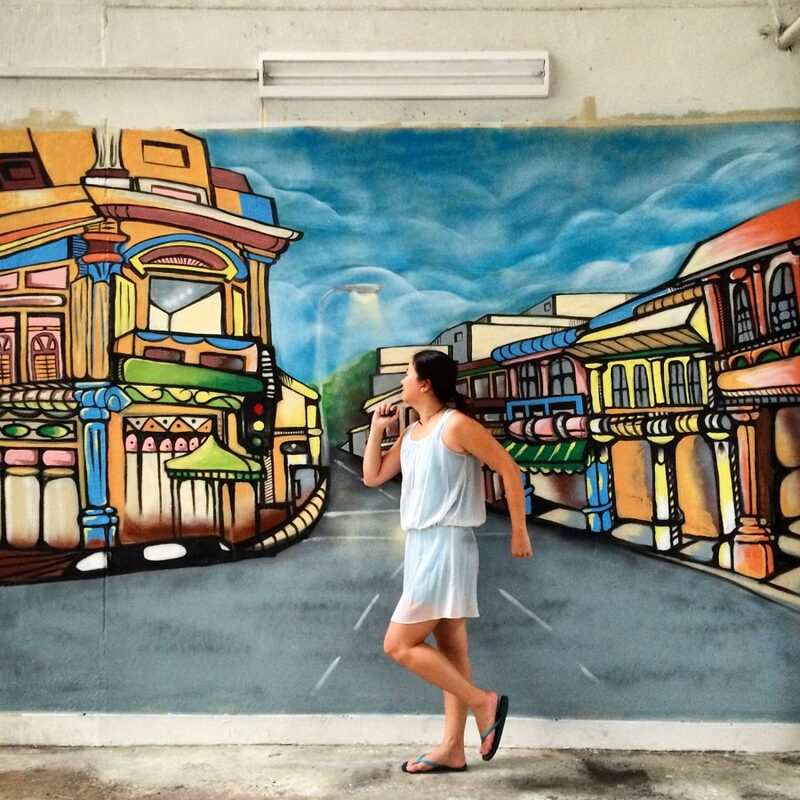 It’s also right next to the colourful Tan Teng Niah House which is popular with the Instagram crowd. 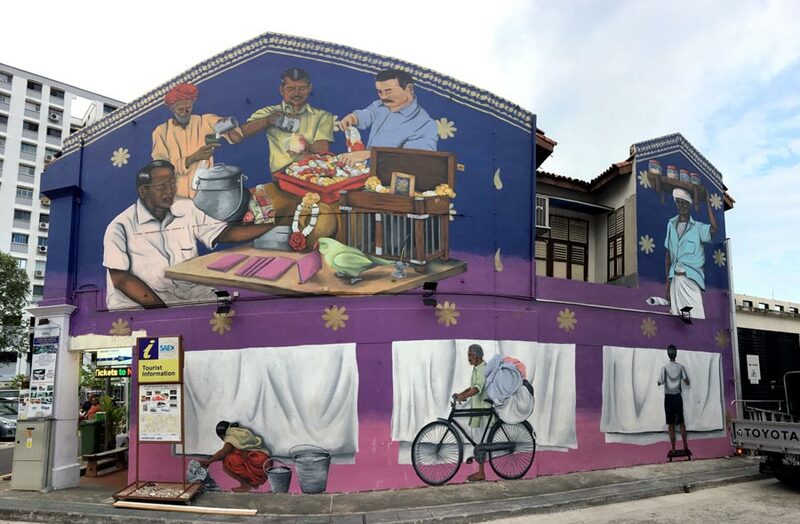 Head over to busy Belilios Lane and it’s hard to miss this very large piece by Psyfool called Traditional Trades of Little India which features various Indian tradesmen that can be found in this area. There is the parrot astrologer who uses a parrot to pick fortunes, a garland maker who makes these fragrant flower chains, Kacang Puteh man who sells the street snacks, and of course the dhobis – washermen and women for which the Dhoby Ghaut area was named for! There used to be a hidden work further inside the alley by Mojoko, reminiscent of old Indian cinema posters. 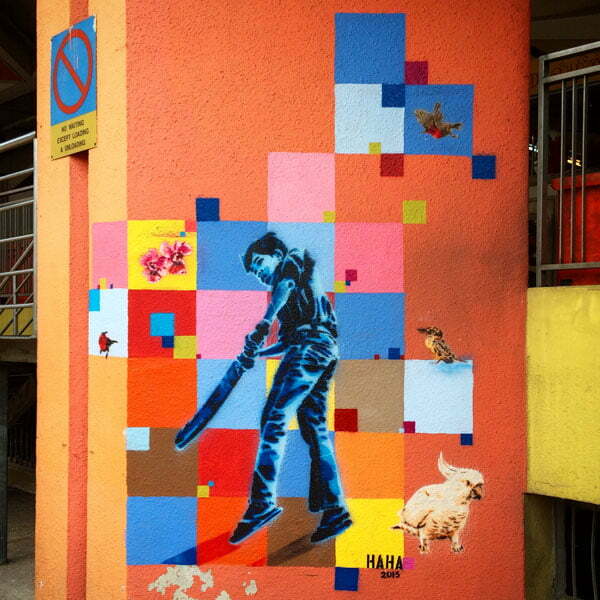 Sadly as it’s a paste up work, it didn’t hold up to Singapore’s rainy weather very well and you can’t see it anymore. Right across the road from the Trades of Little India work is a piece that might go unnoticed on the side of the wall of Village Curry. This mural is by Yip Yew Chong whose heritage works can also be found in Chinatown. This piece showcases traditional curry and prata making, as well as old school cattle farming, and even a tiny Taj Mahal window view that you can enjoy while you eat. 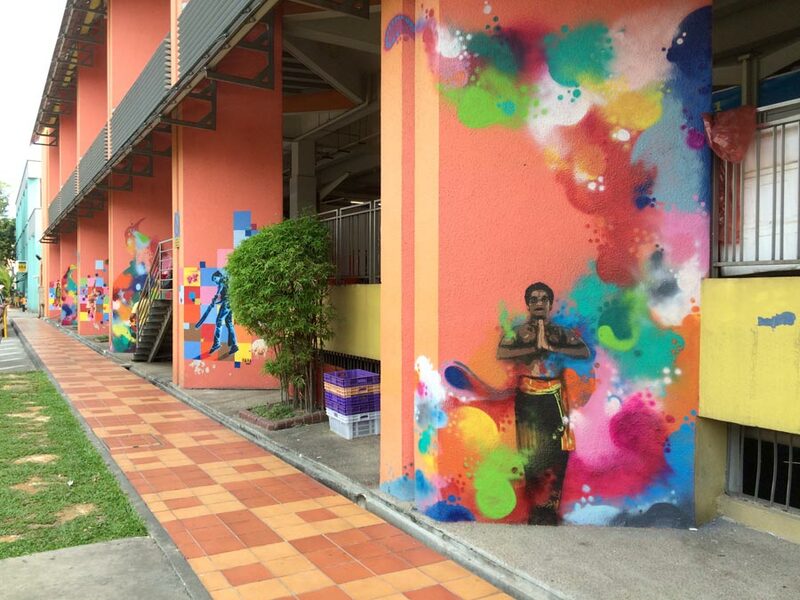 Head over to the the famous Tekka Centre and look for the entrance to the carpark along Buffalo Road – that’s where you will spot these lovely collaboration works by Singapore’s TraseOne and Australia’s Haha aka Regan Tamanui is celebration of SG50 for a project called 50 Bridges in May 2015 titled Cricket and Classical – both Indians and Aussies are huge cricket fans. I liked the Indian dancers and how they really bring out the colour and flavour of the Indian culture. Haha covered the Cricket works while TraseOne did the Indian dancers. The Indian Heritage Centre is a super modern and funky looking building with sharp edges and reflective surfaces, quite a large contrast to the weathered shophouses surrounding it. A very informative and interactive museum worth checking out if you want to learn more about the Indian diaspora in this part of the world. Also, it’s a great place to cool off in if the weather gets too hot outside. These Kathaka Indian dancers are not the easiest to photograph because of the location and pillars. 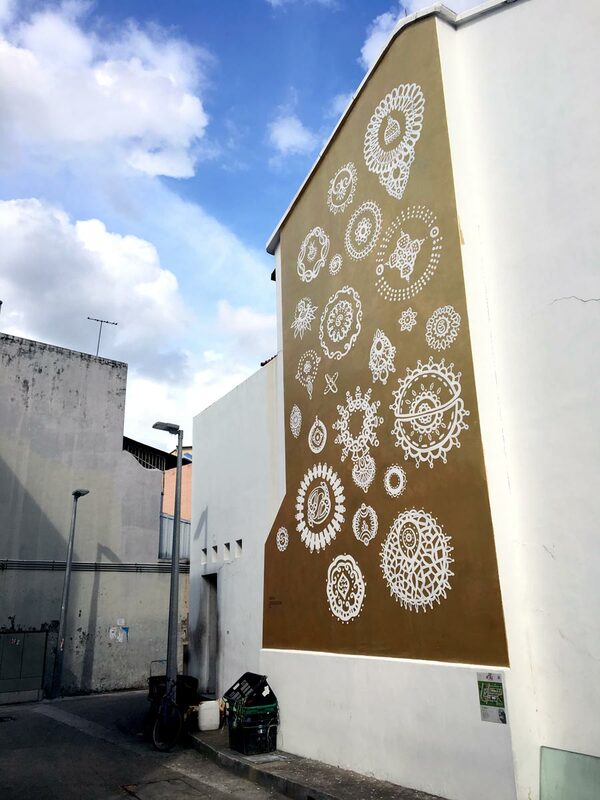 You probably have seen Didier Mathieu aka Jaba‘s works if you’ve been to Kampong Glam – they are all over the side of Piedra Negra, although the style there is quite different from these works that he created for ArtWalk Little India 2017. 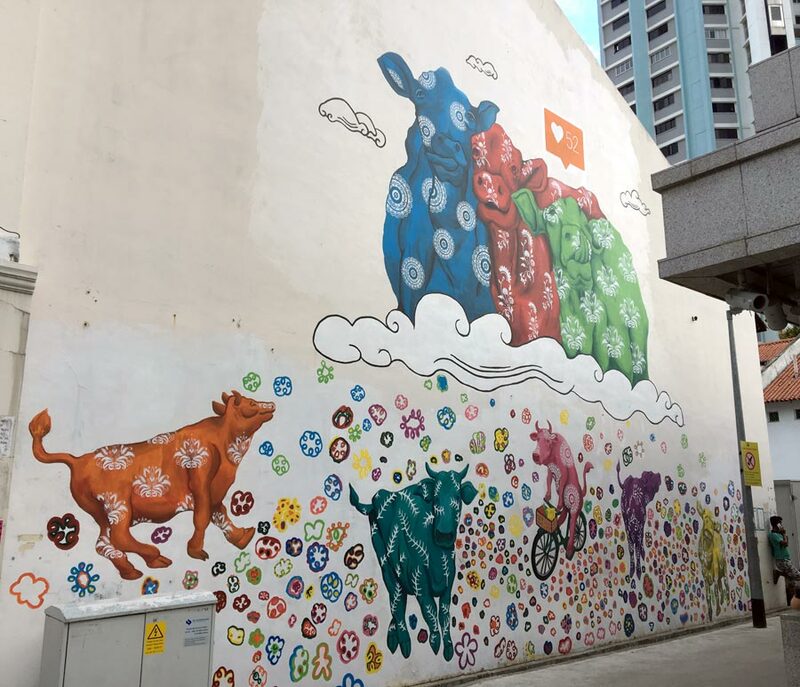 Right across the road from the Jaba work is another mural by Eunice Lim (who did Cattleland 2 above) called Book-a-Meeting for Artwalk Little India 2018 which is an ‘extension’ of the 30-year old Siyamala bookstore it is connected to. The mural has an instruction to tell the man ‘Nalla’ – that man is the same person sitting at the corner and running the bookstore. Loops of the Precious is a little bit more hidden, but you can find it in a little alleyway just past the Didier work above. This was done for ArtWalk Little India 2016 by Priyageetha d/o Diayalan. It was inspired by the artist’s grandfather who was a goldsmith, another traditional trade popular among the Indian community found in this area. 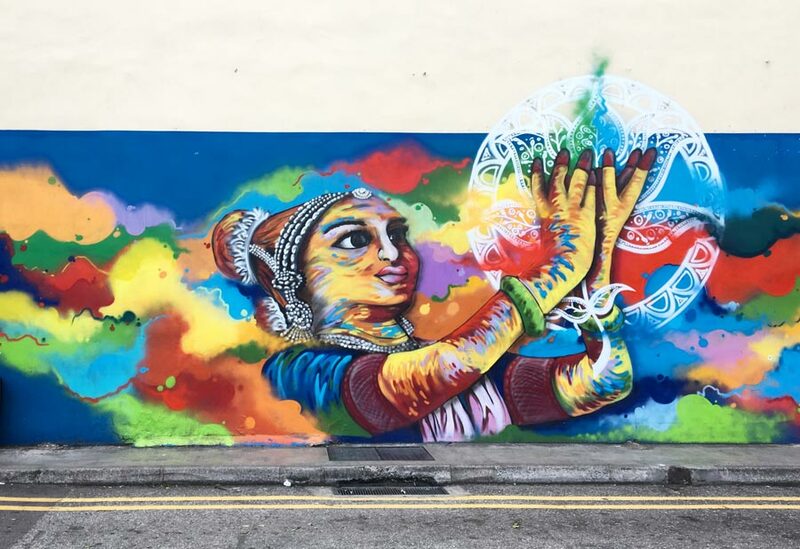 This colourful graffit-style piece called A Scent of Lights by local street artist SONG is meant to visually represent the hodgepodge of smells and sights you get in Little India, from burning incense and jasmine flowers, to glittery gold bangles and rainbow hued spices. It’s a bit more abstract but the longer you stare at it, the more you see familiar images pop up, and I love the brightness of this work – it was done for ArtWalk Little India 2019 which has a fragrance theme. 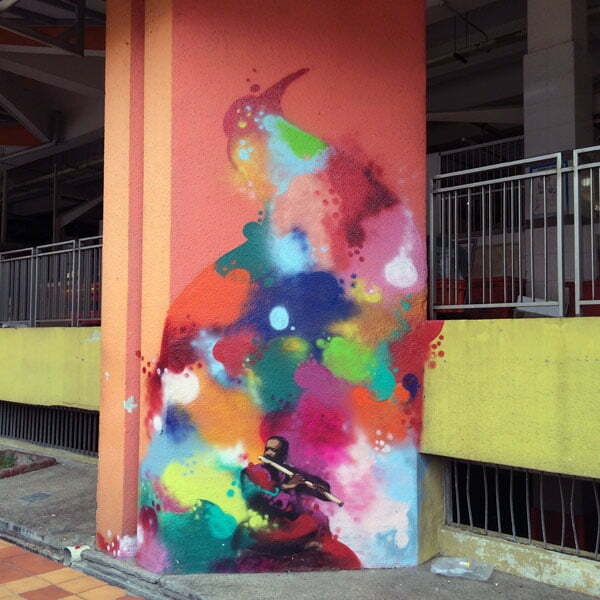 TraseOne’s work for ArtWalk Little India 2017 Alive @ Clive is this large colourful piece of an Indian dancer right in the middle of what feels like Little India’s busiest junction. I think it definitely captures the vibrancy of the area and is really eye catching! You’ll notice the colours and style are similar to his Cricket and Classical work along Buffalo Road done 2 years prior. Further down from the Upper Dickson murals, you should come across this open green space. At the time I saw it in mid 2017, there were lovely colourful buffalo statues all around this mini park and lots of people were just sitting around and enjoying the art. On the shophouse wall facing this green space is this mural by an artist called Dyn called I Am Still Here which is meant to put a face to a place that continue to hold on to traditions even in the face of modernism. She looks a little like she’s peeking out from behind those trees. This untitled work by Sobandwine for Art Walk Little India 2018 is meant to be an anonymous love email letter of sorts and a bit open-ended using the flower language instead of actual words. Marigolds are apparently meant to be a love charm of sorts, but the symbolism of marigolds range far and wide from despair to creativity depending on your culture so make of that what you will. 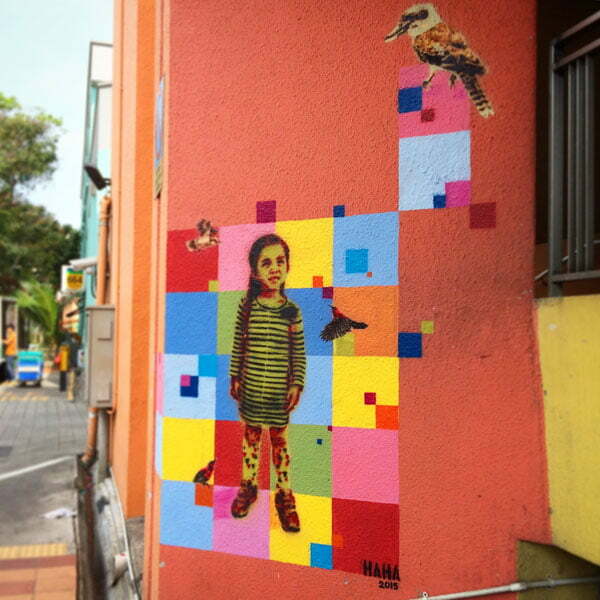 Most of Lithuanian artist Ernest Zacharevic’s works in Singapore are found in Kampong Glam, but you can find one of his earlier works from 2012 here at Perak Hotel – a cheeky little boy with a hundred dollar bill on a fishing line. 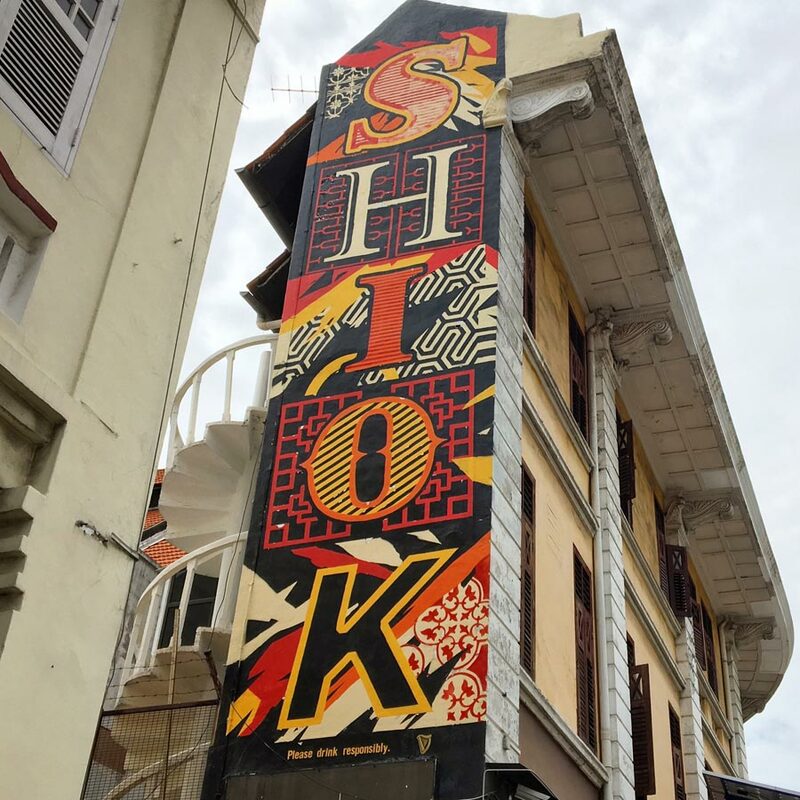 If you have a chance to go inside the Perak Hotel, you might also be able to spot some of his other works that you can’t see from outside – check out this photo album for more. Break up your street art hunting by popping into the famous 24-hour Mustafa shopping centre, perfect spot for insomniacs or anyone willing to dig a little for a good bargain as stuff here is a little cheaper than in other shopping malls in Singapore. The pedestrian stretch between Rowell and Desker Road are where you can see works by two prominent American street artists Elmac and Tyke Witnes AWR who were invited to put up their works during the Singapore Night Festival in 2010 – these are some of the older murals that are still around today, which is quite a feat, though that alleyway is a little more cluttered up with plants and people these days. 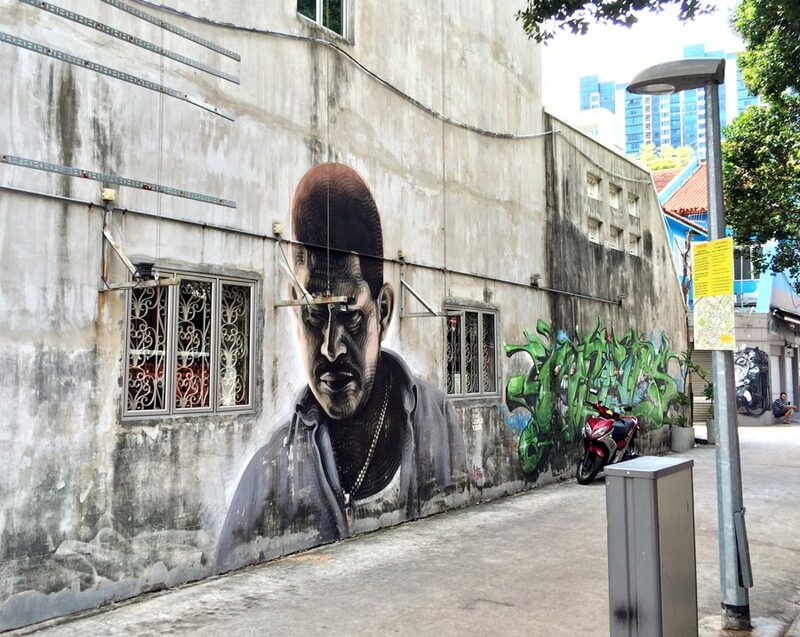 Light in Little India by Elmac – this is one of my all time favourite works in Singapore and around the world. I first saw Elmac’s work in London and was blown away by it – he has a very distinct style using concentric circles that is great to see up close – only to be even more stoked when I found out he actually created a piece in Singapore. He uses actual people as subjects, and while this portrait Light in Little India looks like a local Indian man, it’s actually based off a photograph of a person he met in Miami. The more graffiti style work in that same alley is by Tyke Witnes which is quite different from the Elmac work, but still impressive stuff and quite striking though it’s looking a more faded these days. Just down the alleyway is this new work by Shah Rizzal for ArtWalk Little India 2019 called Flavours, and meant to be a visual representation of the smells of spices and herbs around the area. It looks a little like a swirling galaxy from afar. And here’s a peek at something that used to be on this wall when the restaurant was called Bellwethers Bistro – a surprising series of fairytale related art. 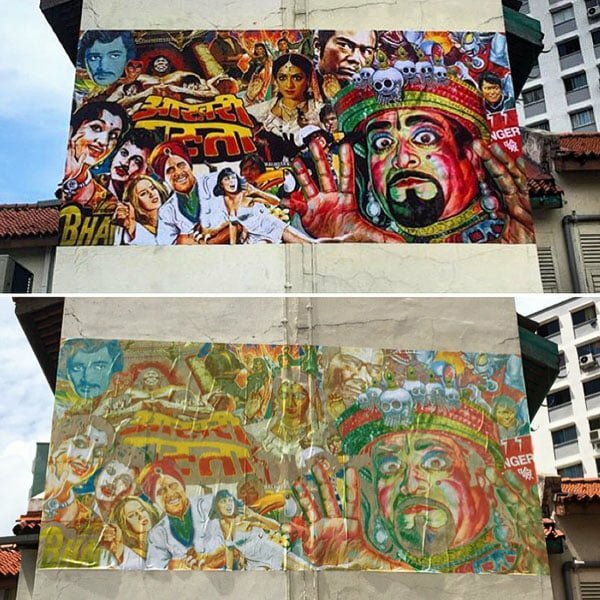 This quirky rendition of Little India called Layers by is also by Shah Rizzal for the 2018 edition of Artwalk Little India. 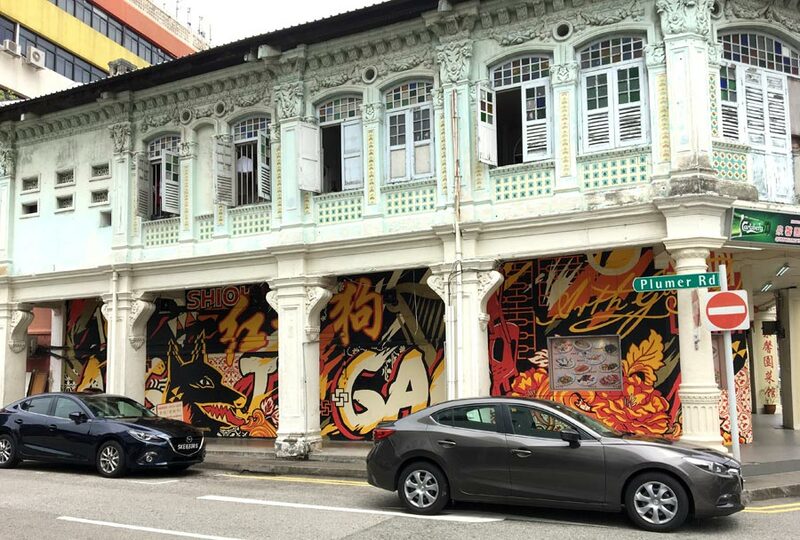 It’s a bit different from his usual more graffiti style, but you can actually find all these buildings in this mural around Little India, so keep your eyes peeled. Note there are some dotted line silhouettes, room for more new things in future alongside the mishmash of the current day. I love this giant work by Jaba (who did Kathaka above) called Daily Delivery along Serangoon Road which is a look at the traditional tiffin business, where meals were delivered to people around the area in tiffins or stacked metal containers. Here’s a shot of the artist in action back in 2018 – I was pretty lucky to see him at work while on the media tour for ArtWalk Little India 2018. This mural has lots of Little India elements in it, and I have to admit this kind of style isn’t my thing but it’s pretty bright and vibrant and fun. This portrait in Working Class Hero is of an iconic Tamil film star called Rajinikanth in his heyday (he’s a bit older now) who is apparently a favourite of the working class folk and meant as a tribute by notable local street artist Zero to the migrant workers living in this area. This is yet another ArtWalk Little India 2017 work. 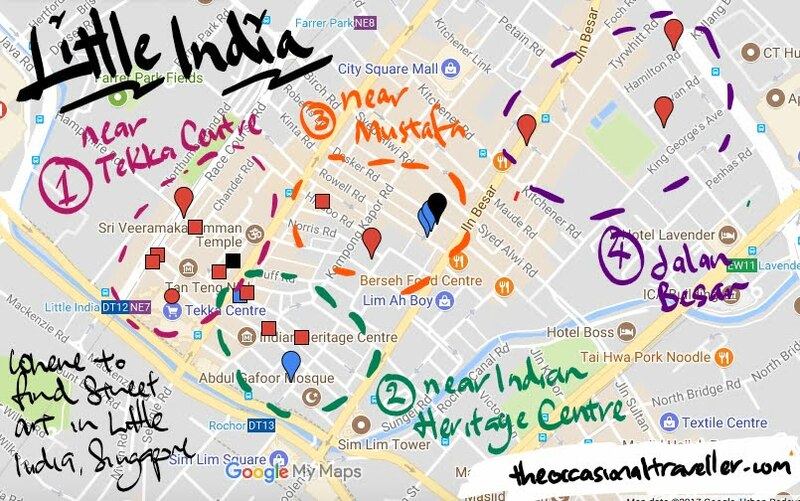 This work called A Sailor’s Guide to Little India by A’shua Imran for ArtWalk Little India is an imagined map that reflects the journeys of the people who first arrived in Little India that tells stories about their lives and encounters. 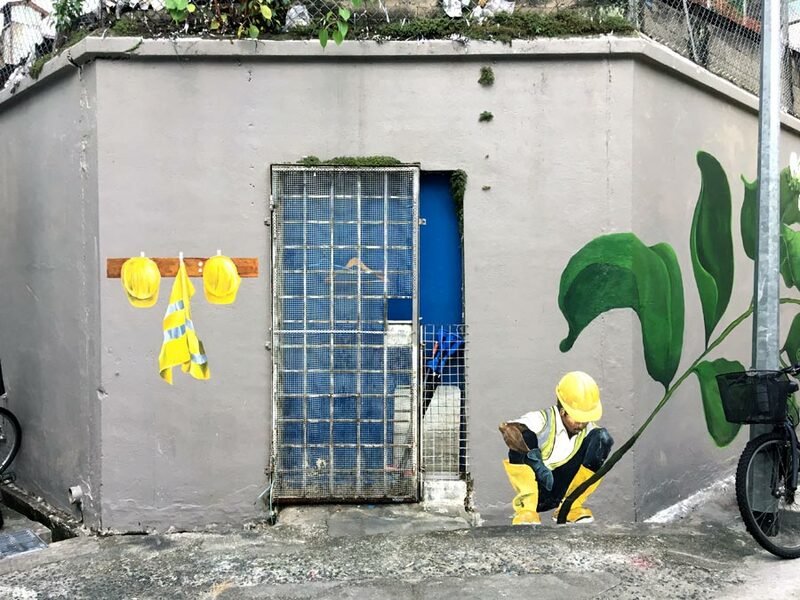 There are a bunch of different murals located in the void deck of Blk 640 Rowell Road, where the Jalan Besar Rowell Court Resident’s Centre is, but this one by Kyerule is my favourite. 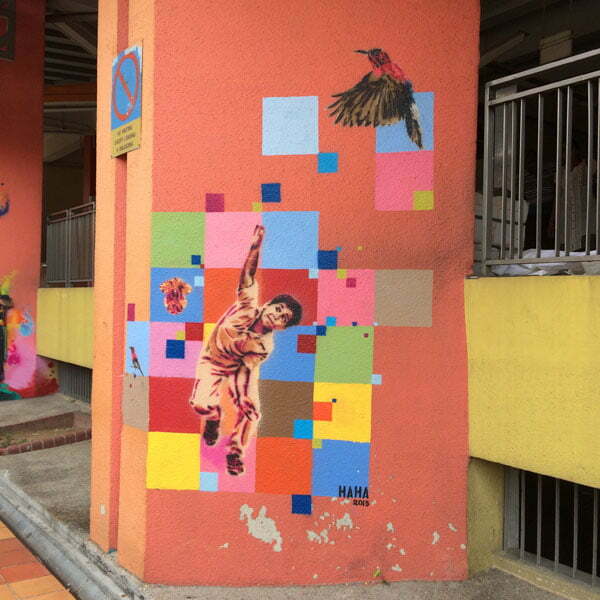 Strictly speaking, I wouldn’t consider the Jalan Besar district a part of Little India, but it’s close enough to stroll over to and there aren’t any other notable street art works in Jalan Besar to talk about, so I thought I’d include them in this guide for now. These murals were commissioned by Guinness to launch their new Foreign Extra Stout and created by Illustration Studio MadebyBen. 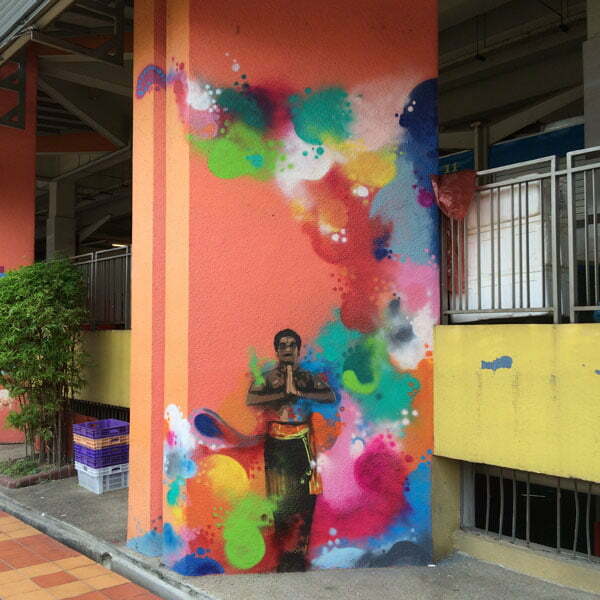 Share your favourite street art works in Little India with me. 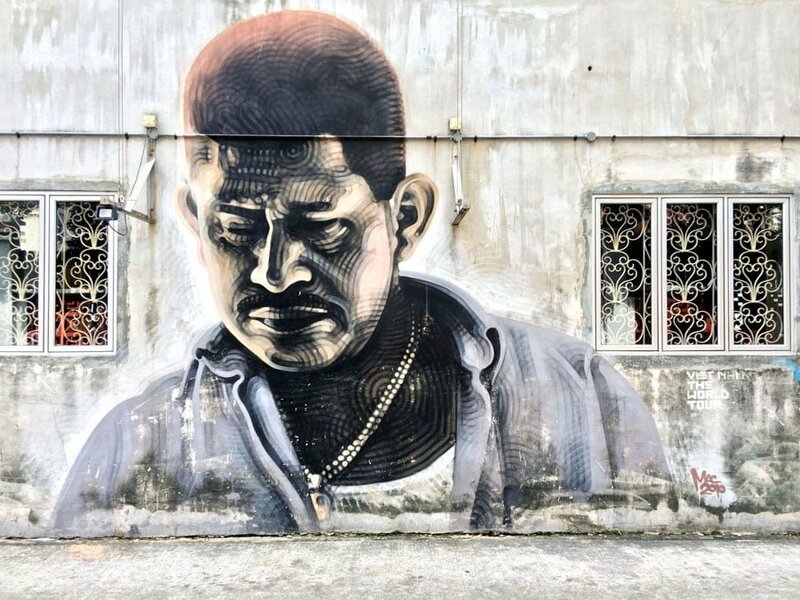 Check out Singapore Street Art on Instagram for more places in Singapore to discover awesome street art, or a global street art site that I contribute to called Street Art Cities. 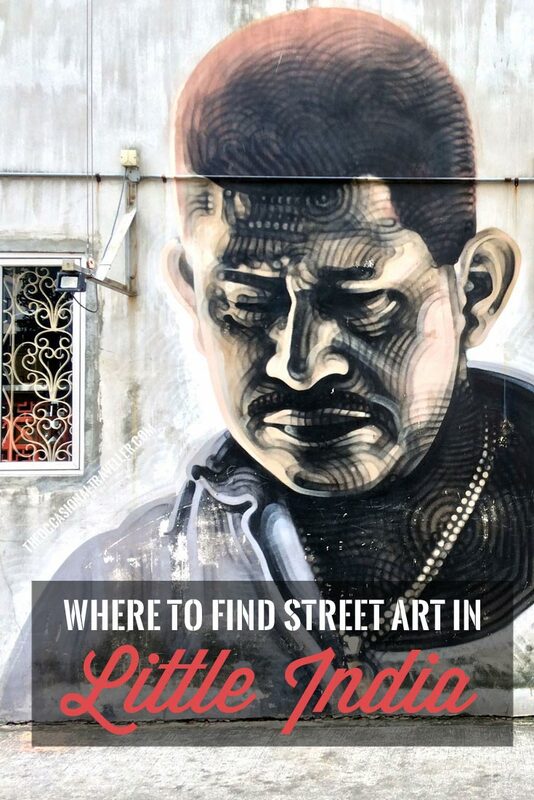 If you are in Singapore, you can also check out my guides for Kampong Glam, Bras Basah-Bugis district or Chinatown for more street art, or see my full line up of street art guides from Asia and around the world. Great job! Love the vibrant, well taken pictures and comprehensive info. You obviously did a lot of research. 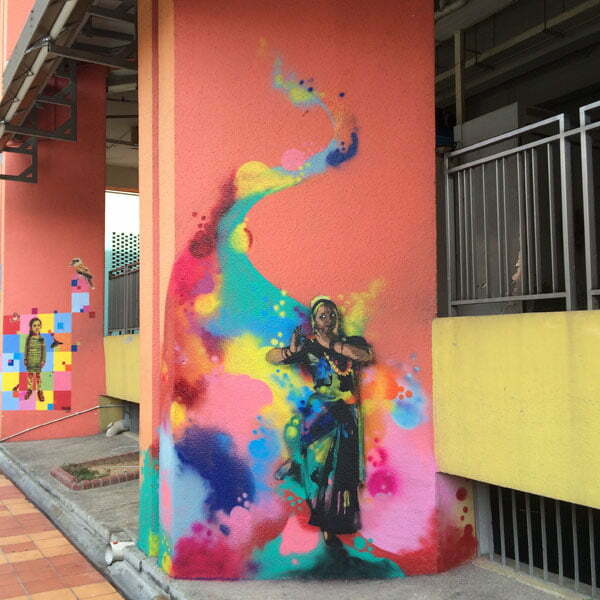 The images of street arts you have included of Clive Street, Dickson Road, and Perak Road are lovely. I actually came into the blog by seeing little India. Hi! Are you planning to update the map with the 2018 art works? Hi Beatriz, the map has been updated with the 2018 works – look out for the square icons. The one by Eunice got whitewashed recently… the one by Haha and Ts1 I’m pretty sure was still up the last time I was there though! But then again these things can change pretty quickly! I’ve been to Little India several time and was only familiar with a handful of the street art there! Really helpful… how did you manage to discover them? Thanks for the info on this. I’ll try to make time to visit the next I make it to Singapore. I used to be one of those people very uneasy about street art – is it true art v vandalism? Then I saw the amazing displays of art work whilst in Melbourne and could really appreciate the high level of skill and creativity used by so many. Well like all art, some of it is an eyesore, but the really good ones are awesome and jaw dropping! I like the way street art has an additional element that often uses or reflects the environment that it’s in, which is something you don’t always get from art hanging in galleries!